The Millennium Bridge is one of the 8 London bridges that span across the river Thames. On one end of the bridge is St Paul's Cathedral and on the other end is the Tate Modern art Gallery. I decided to walk to St Paul’s cathedral on a blistering cold and windy day. Under the overcast sky, the dull white structure appeared almost drab. But Like Westminster’s Abbey the real beauty of St Paul’s Cathedral lies inside it. Most of the people find cathedrals and churches boring to visit; they click a few photographs from outside and quickly leave for the next destination. But for people like me who revel in quietude, time spent inside St Paul’s was simply amazing. The sheer beauty of the cathedral, the magnificent stain glass and the paintings inspire peace and serenity. You are almost compelled to sit quietly and connect with yourself and God. Clicking photographs inside the cathedral is not allowed. The most imposing thing about St Paul’s is its three domes. The outer dome is what is so prominently visible in the London Skyline and makes St Paul such an iconic landmark. The interior dome, that one can see from inside the cathedral is a masterpiece in painting and art. Between these two domes is yet another dome that acts more like a support structure. Three galleries run inside these domes. In case you are wondering why I am describing the domes in such details, it’s because I spent the better part of the morning climbing them to reach the galleries. All the galleries are accessible to public provided you are willing to climb dizzying heights to reach them. The first gallery is the whispering gallery, so called because even a whisper can be heard on the other side of the gallery- an effect of the acoustics there. The Whispering Gallery is reached after climbing 357 steps of a long, winding circular stairway. It wasn’t exactly a pleasant climb because it was a narrow closed stairway and I tend to get claustrophobic very soon. I didn’t get a chance check out the acoustics there because a whole lot of tourists whispering together just created cacophony! But if look down at the cathedral floor from the gallery you do get a stunning view of the murals and the naive. Next comes the Stone Gallery after another dizzying and claustrophobic climb of 150 odd steps. This gallery is open and you get a very panoramic view of London when you peep over it. My knees and back were creaking and shaking and protesting loudly by the time I had reached the stone gallery. But this view of London made the effort worthwhile. ﻿Now all that was left was the Golden Gallery. Most of the tourists don’t go up till the Golden Gallery. It’s not an easy feat even if you are totally fit and not claustrophobic – and I was neither! But I persisted and decided that another 150 odd steps couldn’t hurt me. How wrong I was. The climb up till the golden gallery was much much worse. The staircase was so narrow that my shoulders almost touched the two sides of the walls. I became so claustrophobic and breathless halfway though that I almost decided to give up. But there is a separate staircase for coming up and another one for going down so there was no way I could backtrack and go down. So with my lungs burning with the effort and panting like a fish out of water, I carried on. But the worst was yet to come – Till the last 50 steps the staircase was narrow but closed – it gave you a very claustrophobic but a secure feeling. The last 20 odd steps were nothing but a circular iron staircase going up the dome – I really couldn’t see the top of the dome even if I craned my neck. All I could see was this open circular stairway going up and up to nowhere ! And if you dared to look down you would get a dizzying view of the cathedral floor 365 feet below you. Oh and did I tell you I am scared of heights! This is a pic I clicked from the iron staircase. Yes I was dizzy, hyperventilating and about to faint but I still managed to click a snap. Just to give you an idea about high up I was – those black spots are people and the brown ones are chairs! Needless to say the view of London from the Golden Gallery is absolutely breathtaking. As usually happened to me during my stay in London, the weather gods turned against me and the sun was completely obliterated by clouds! Can you see the London Eye in the distance? From the Golden Gallery, you can also see "Big Tom" – the clock face on the right-hand tower of the cathedral. After an arduous climb down the galleries, with my knees wobbling and about to give in any minute, I sat down on the steps of the Cathedral to rest my tired and aching feet. 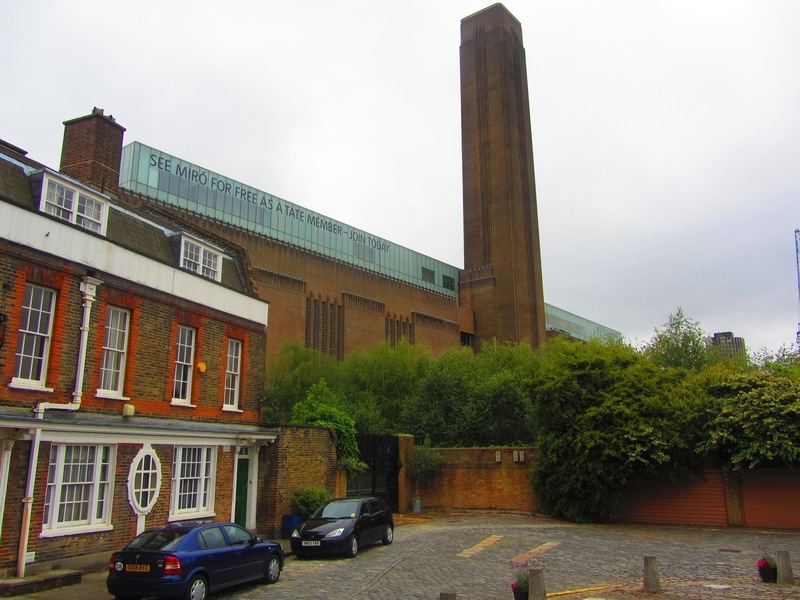 Frankly Tate Modern is a rather drab brick colored building that doesn’t look too inviting from outside. But it is one of the best modern and contemporary art galleries that I have been to and is definitely worth a visit even if you are even a teeny weeny bit interested in art. 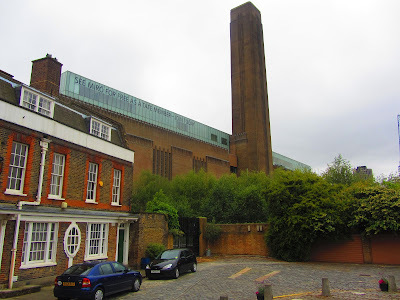 The most intriguing thing about Tate Modern is that its actually an old Power station that has been converted into an art gallery. I had come on your blog earlier also.I felt happy to see you in Indiblogger meet. @Rakesh - Thank you so much. It was god to meet you too ! @BIkram - Yes London indeed is beautiful ! you are lucky to live there ! That's cool pictures again Ruchi! Have recently went to London and was enjoying every bit of it! No matter what, London rocks!